Do assassinations achieve their political aims and how do agents really carry them out? 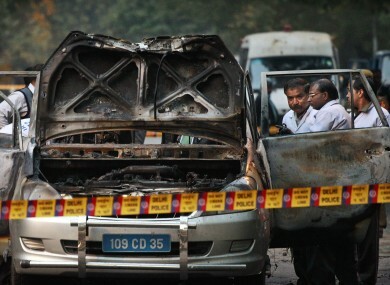 New Delhi police on the scene of Monday's explosion. ORGANISED COVERT killings have been carried out by various states, organisations and individuals for decades in an attempt to destroy a particular group or alter political history. At least four people were injured this week when a device attached to an Israeli embassy car exploded in New Delhi, while police in Georgia said they averted an attack on an Israeli embassy vehicle in Tbilisi. A hand-grenade had been found taped to the underside of that car. Meanwhile, Thai authorities said that one man was seriously injured when a grenade he was carrying exploded in Bangkok. Officials later said they believe that some of the several suspects involved in the explosion are Iranian citizens and were planning to attack Israeli diplomats. Earlier this year, an Iranian nuclear scientist was killed when a magnetic bomb attached to his car exploded in Tehran. In November, two Iranian scientists were targeted in separate incidents in which attackers on motorbikes attached bombs to the windows of their cars. With this in mind, TheJournal.ie got in touch with Dr Joseph Fitsanakis, coordinator of the Security and Intelligence Studies programme at King College in Tennessee, to discuss how and why assassinations are carried out – and if the attacks really achieve their aims. Although methods of assassination vary greatly, the one common trend Fitsanakis notes is the apparent increasing complexity of the planning involved before the operation is carried out. “During the Black September killings which followed the Munich 1972 killings of Israeli Olympic athletes, [the assassinations] were pretty low-tech and haphazard and a lot of luck was involved in those operations and they were small teams. What we’re seeing nowsadays is a lot more sophistication, a lot more preparations, especially in the cases of Alexander Litvinenko and Mahmoud al Mabhouh in Dubai. Fitsanakis estimates that around 40 people were involved in the al Mabhouh assassination, which has been blamed on Israeli intelligence agency Mossad. Six of the suspects involved in the killing were carrying forged Irish passports, which prompted Ireland’s expulsion of an official from the Israeli embassy in August 2010. Details from the attacks reported in New Delhi, Georgia and Thailand last week suggest that they were carried out in a hurry, he says, and the fact that they failed suggests the agents involved didn’t do their homework. In the wake of recent Russian spy scandal and the Dubai killing, Irish passports have become known as being much-coveted by intelligence agents given Ireland’s broadly-favourable international relations. However, Fitsanakis says that IRA members are also known to have availed of forged and stolen passports – and that former Libyan leader Muammar Gaddafi was instrumental in securing passports for them. Fitsanakis says that the IRA received forged Libyan passports and that when Libya became a ‘red flag’ country, the Gaddafi regime provided other -genuine – passports which had been lost by foreign visitors while in Libya. But agents also have to impress their own superiors in carrying out the attacks – and they need to achieve their main aim, which is the assassination. What intelligence agents look for is results, so if the results has been achieved, then it was successful from their point of view, Fitsanakis says. However, while assassinations can change history, they don’t necessarily achieve the longer-term objectives of that agency’s superiors or the state that’s hired them. “‘Decapitation operations’ are where you go after the leaders of particular groups in an effort to neutralise the groups,” Fitsanakis explains. But, he adds, research (such as this paper by Jenna Jordan at the University of Chicago) shows that it doesn’t necessarily work out that way. Fitsanakis says that as the world gets more complex and it becomes more difficult for superpowers to achieve their goals – such as the US engagement in Iraq and Afghanistan – it’s very tempting for states to skip negotiations or military engagements and go straight to special operations. Email “Secret agents and magnetic bombs: the how and why of modern assassinations”. Feedback on “Secret agents and magnetic bombs: the how and why of modern assassinations”.